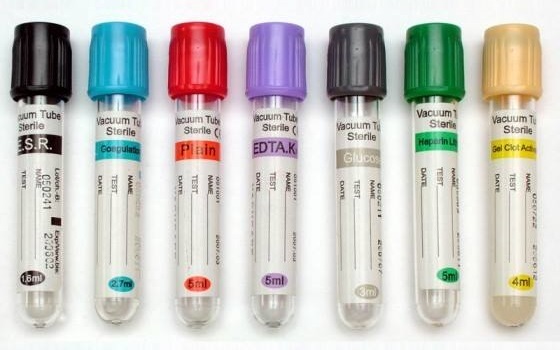 The evacuated tube system for blood collection in use for various laboratory tests consists of tubes of various sizes, with color coded tops indicating tube contents. Most blood collection tubes contain an additive that either accelerates clotting of the blood (clot activator) or prevents the blood from clotting (anticoagulant). The red bottle is less common – it is used for biochemistry tests requiring serum which might be adversely affected by the separator gel used in the yellow bottle. Additive: None or contains silica particles which act as clot activators. What additive does: Clot activator promotes blood clotting with glass or silica particles. What additive does: Prevents the blood from clotting and stabilizes bacterial growth. Tubes with SPS – For Blood and bodily fluid cultures (HLA, DNA, Paternity). The SPS aids in the recovery of microorganisms by slowing down/ stopping the actions of complement, phagocytes, and certain antibiotics. Tubes with ACD are for cellular studies, HLA typing, paternity testing. This less commonly used bottle is for biochemistry tests which require heparinised plasma or whole blood for analysis. What additive does: Sodium fluoride acts as an antiglycolytic agent to ensure that no further glucose breakdown occurs within the sample after it is taken. Potassium oxalate removes calcium and acts as an anticoagulant. will please tell me how much amount of additives required in each type of test tube.